Specialising in the development and manufacturing of a range of Remote Weapon Systems for various applications. The Rogue LITE remote control weapon station from Reutech Rogue International is the ideal gyro-stabilised weapon for overhead use on military vehicles and naval vessels that need to reduce risk to the operator as well as remain mobile while under fire. The product is aimed at Armoured Personnel Carriers and small naval craft where the requirement exist for a basic remote control weapon station capability. This remote control weapon includes fire direction system software that facilitates accurate firing at moving targets. The platform can be fitted with 7,62mm, 12,7mm or a 40mm grenade launcher. The Land Rogue remote control weapon station from Reutech Rogue International is the ideal gyro-stabilised weapon for overhead use on military vehicles that need to reduce risk to the operator as well as remain mobile while under fire. This product includes optical tracking and laser range finder for vehicle requirements requiring a high degree of accuracy. This remote control weapon includes fire direction system software that facilitates accurate firing at moving targets. The platform can be fitted with 7,62mm, 12,7mm, 20mm light machine guns or a 40mm grenade launcher. The Sea Rogue remote control weapon station from Reutech Rogue International is ideally suited to naval applications such as stabilised primary weapons on a patrol boat and countermeasures against asymmetric threats on larger vessels. The Sea Rogue is controlled with a hand-controller and a video sight from the safety of the bridge or the ops room. This product includes optical tracking and laser range finder for naval requirements requiring a high degree of accuracy. The platform can be fitted with 7,62mm, 12,7mm, 20mm light machine guns or a 40mm grenade launcher. 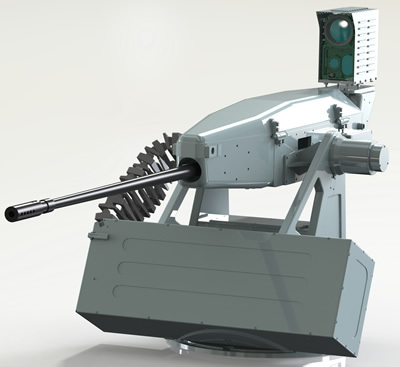 The Super Sea Rogue remote control weapon station from Reutech Rogue International is equipped with the Rheinmetall KAE 20 x 128mm rapid fire cannon, using the NATO standard ammunition. The Super Sea Rogue is ideally suited to naval applications such as stabilised primary weapons on larger naval vessels or as self-protection weapons on the sides of a bridge. The Super Sea Rogue is controlled with a hand-controller and a video sight from the safety of the bridge or the ops room. This product includes optical tracking and laser range finder for naval requirements requiring a high degree of accuracy. The Super Land Rogue remote control weapon station from Reutech Rogue International is equipped with the Rheinmetall KAE 20 x 128mm rapid fire cannon, using the NATO standard ammunition. Alternative 20mm weapons can also be fitted such as the Denel GI-2 20 x 139mm rapid fire cannon. The Super Land Rogue is the ideal gyro-stabilised weapon for overhead use on military vehicles that need to reduce risk to the operator as well as remain mobile while under fire. This product includes optical tracking and laser range finder for vehicle requirements requiring a high degree of accuracy. This remote control weapon includes fire direction system software that facilitates accurate firing at moving targets. The Missile Rogue remote control weapon station from Reutech Rogue International is equipped with a User defined missile system integrated on either a 12.7mm or 20mm remote control weapon system platform or autonomously in the land and naval domains. Missile Rogue consists of a stabilised weapon platform and high definition day/night sight, to launch and guide light weight multi-role missiles. The system provides an autonomous rapid reaction long stand-off range capability with a close range weapon redundancy. This remote control weapon includes fire direction system software that facilitates accurate firing at moving targets.